On 26th August 2015 our company received the “Achievement Award of the year 2015” from the hands of His Excellency Dr. K. Rosaiah, Governor of Tamilnadu, at Hotel Hablis, Guindy Chennai. On 8th August 2015 our company received the “Best Modular Kitchen Manufacturer of the year Excellence Award” from Lisa Ray the International Brands Academy, at Bangalore. 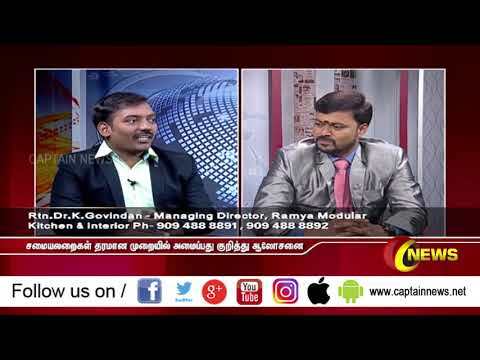 25/12/ 2018 Live Show in Captain News. I was talking about Modular Kitchen and Interior Design. This meeting was organised by C TV Communications at Hotel Habils Guindy Chennai My photo with the Governor appears in today's news paper (29.08.2015) Makkal Kural.